Charlie Libin, Jim McCullagh and Jim McCmillan of Friends of Ciné Institute (FOCI) travelled to Jacmel, Haiti to help Ciné Institute unload, set up, and distribute supplies and equipment sent FOCI in a shipping container. 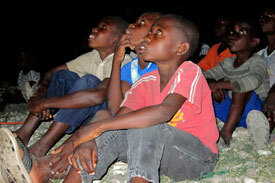 Ciné Institute provided free public screenings as an entertainment relief effort for the displaced community of Camp Pinchinat. We hope our films will bring a little laughter and light. Ciné Institute was invited by the Governor General of Canada, Michaelle Jean, to accompany and film her visit to Jacmel for International Women’s Day. Much to her delight, it was an all female Crew.